Photo Degradation by Ultraviolet Light – Sunlight. Solar radiation is the most damaging component of the outdoor environment affecting every exposed surface. The first change you will notice in your exterior wood will be the damage inflicted by sunlight. This will be seen by an initial color change from its beautiful golden, orange-brown color to gray. This color change is actually the decomposition of lignin (nature’s glue for holding wood cells together); as it progresses the wood color darkens. Leaching – Swelling/Shrinking due to Water Absorption by the Wood. Sun and rain cycles cause moisture fluctuations in the wood. The shrinking and swelling stresses the wood causing checks and splits to develop. Hydrolysis (as in acid rain attack) is also a contributor to this degradation of your wood. Decay Promoting Microorganisms – Fungi, Mold and Mildew. Wood’s natural protectants leach out in a relatively short time and allow colonization by wood-inhabiting fungi. Once established, and aided by favorable climatic conditions, these microorganisms can have a rapid, devastating effect causing your wood to become soft, stringy, pitted, cracked or even to crumble. Depletion of Old Growth Timber. Another important consideration is that the majority of today’s cedar and redwood lumber is being processed from younger, less decay resistant trees. These young redwood and cedars harvested today may need protection earlier than the premium hart woods that were once widely available. These factors, coupled with an increased awareness of various environmental issues in recent years to protect what remains of our old growth timber, are further reducing the supply of high quality wood. With all of these factors, (sunlight, water and fungi, attacking your untreated exterior wood ) you will soon notice your wood becoming “spongy”, sidings begin to curl, laminated siding will delaminate, boards on decks and fences begin to warp, split, and crack, and in severe exposures; wood rot becomes evident. This can happen even more rapidly on T111 siding; because of all the small surface cracks and splits in this type of wood. Slope – Verticals and horizontals will reach different shades as they are exposed to different levels of sun, dirt and moisture. The more horizontal wood is, the more likely it is to suffer decay from fungi. Direction – South-facing wood suffers because it experiences the greatest swings in temperature and humidity, leading to more splits and other degradation. Shading – Wood shaded by trees is more likely to develop mold, mildew, and decay than unshaded wood. In spite of the relentless enemies our exterior wood surfaces face, not only can they be restored, in most cases, to look like new, but they can also be easily maintained! The transformation process involves repair, mold and mildew removal, wood surface preparation; and application of a protective coating. To keep your exterior wood looking like new and avoid the expense of replacing unsightly damaged wood; it is necessary to apply a water resistant coating. This will protect your wood from those enemies we just discussed; sunlight, leaching, and decay. Products which form a protective barrier on top of the wood may look good initially; but are of little value. They easily wear off (usually in less than a year) as a result of weather; and (in the case of wooden decks) traffic. 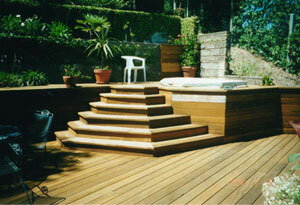 Far superior are products which protect the wood by being absorbed into the wood fibers themselves. These are actually stains which can last 2-3 times as long as surface film applications. The performance of exterior wood stains is a direct result of how much product is absorbed into the wood. For this reason it is best to allow wood fibers to open as a result of the natural aging process before applying the coating. This usually takes between six months to a year. The aging process can be accelerated by spraying the wood with a demilling glaze agent which opens up the wood fabric. Once this aging process is complete the wood must be cleaned and dried. For optimum results we perform the following steps: Click here to go to our cleaning and product application section.